To make room for students from a shuttered elementary school, Berlin’s middle school in the Hillside Complex will move into the high school. Others pin their hopes on school funding debates in the State House. And some warn that without a funding fix, the crisis in Berlin is a taste of what’s to come for property-poor towns across New Hampshire. 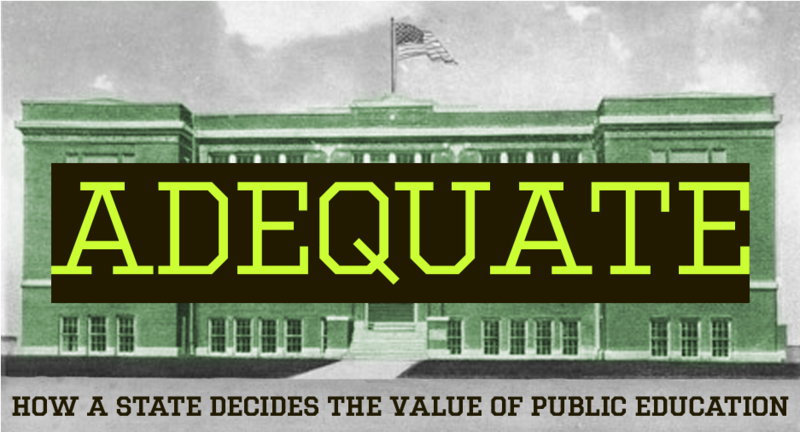 Listen to the second installment of Adequate: How a State Decides the Value of Public Education. In January, the Berlin School Board gathered in the high school library to make an agonizing decision: what to do with the city’s last stand-alone elementary school, Brown School. For years, they’ve cut corners on essentials like staffing and maintenance to avoid closing it. But tonight, they have to face the numbers. Closing the school would save an estimated $300,000 a year. After nearly an hour of discussion, board member Lynn Moore speaks up. She covers her face with her hands. There’s a long silence. Chairwoman Nicole Plourde calls for a roll-call vote. When called, Scott Losier, another school board member, shakes his head silently. “I can’t vote,” he whispers. The Berlin school board looks at budget numbers prior to voting on whether to close Brown Elementary School. The rest vote yes. After the meeting, Chairwoman Nicole Plourde calls it one of the most heartbreaking decisions of her life. In the 1990’s, the New Hampshire Supreme Court told lawmakers to figure out how to fund schools fairly. 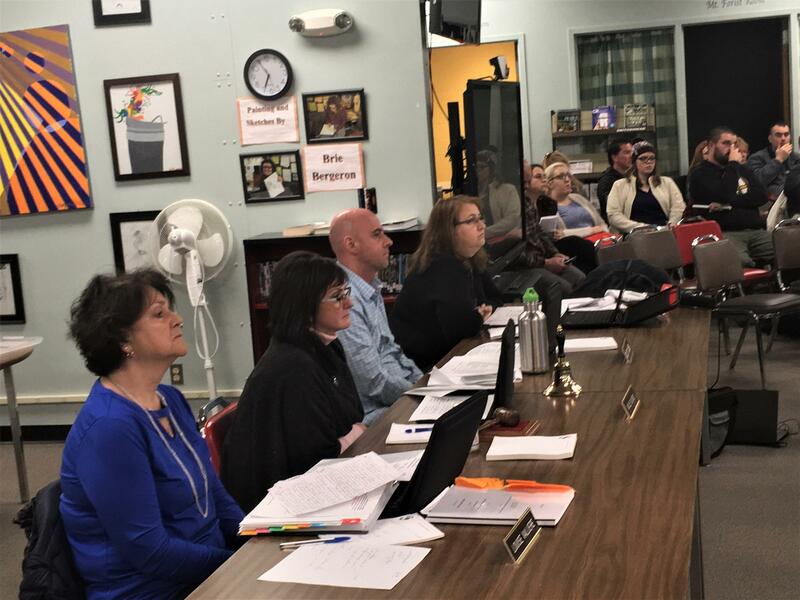 In her 12 years on the school board, Plourde has watched the state chip away at aid, and Berlin respond with tighter and tighter school budgets. “There’s nothing left,” she says. And many say: there’s nothing more to tax. 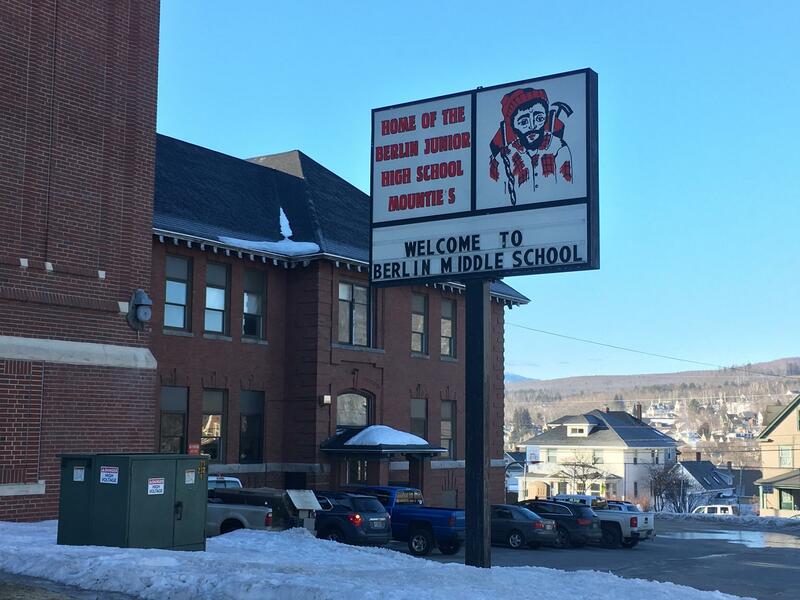 Like most cities and towns in New Hampshire, the money for Berlin’s schools comes from two main sources. The first is local property taxes. The problem is, most of Berlin’s property isn’t taxable - it’s national forest, state and federal prisons, and government land. So in order to raise enough money, the city relies on a small number of businesses and homeowners. Their property values are relatively low, but their tax rate is high - nearly twice the state average. That hits homeowners hard. Kelli Poulin lives a few blocks away from the high school. She and her husband grew up here but then moved away for college, and watched from afar as Berlin’s main industry - the paper mills - shut down. Hundreds lost jobs and left, but the Poulins moved back. Poulin leads me into a sprawling sun room with huge windows facing the mountains. Poulin paid around $200,000 for this view. 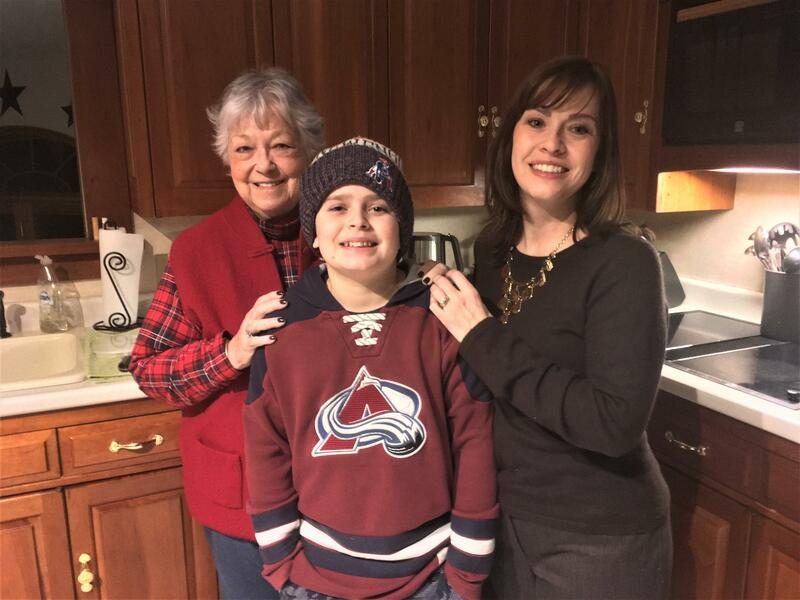 Kelli Poulin (right) in her kitchen with her mother and son. She says her property taxes are now around $10,000 a year, a 2/3 increase from 15 years ago. And in the last few years, she’s noticed a decline in city services, as Berlin funnels more money to schools. The budgets for police and fire departments are shrinking. The streets are crumbling. The snowplows and garbage trucks need to be replaced. “I think people always say: ‘Oh well we’re doing something wrong with our money here in the city of Berlin.’ We’re not doing something wrong here. Things have changed statewide that have affected Berlin,” she says. Aside from local property taxes, the other way Berlin pays for schools is with money from the state - this aid covers nearly half of the school’s budget. For years, Berlin and the majority of New Hampshire towns got extra money because they were property-poor. But since 2016, the state has gradually reduced this aid, called stabilization grants. Berlin and the other towns are getting 4 percent less of this money every year, for the next two decades, until it’s gone entirely. This annual decline is one of the reasons Berlin closed Brown, its last neighborhood elementary school, which served K-2 graders. Leading me through the gym, Principal Melanie McCoy says they have a lot of work ahead of them. 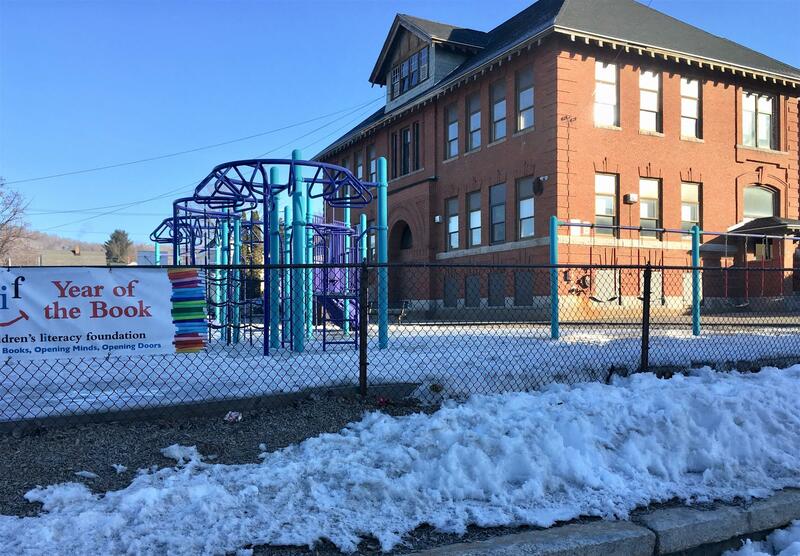 The building that will soon house Brown students was built nearly a hundred years ago as a high school - it currently serves 3rd through 8th graders, but in the next five months, the city needs to retrofit it for smaller kids. McCoy points to the concrete stairs, which don’t have a guard rail. “Kindergarteners and first graders - I mean, they’re tiny little things! So it’s not the greatest situation,” she says. They will have to build guard-rails. In the bathrooms, they’ll lower the urinals, and along the playground, they’ll build a fence. But there’s another problem. Even with the money saved from closing a school, Berlin can’t foot the bill for security upgrades, like new fire alarms and secure doors. “This building is so large and there are so many access points - it terrifies me, I think about it at night,” McCoy says. In another wing of the building, middle school teachers are bracing for their own changes. To make room for these new K-2 students, they have to move into the high school down the street. For middle school science teacher Jamie Welch, that means figuring out what to do with his fish tanks teeming with baby trout and bass. Welch grew up in Berlin and returned to teach and raise a family. His parents taught here too, and his 7th-grade son is one of the students who he worries will lose out with the new building plan. Right now he has his own room, but when he moves to the high school, Welch will be sharing a room with a few other teachers. He won’t have time to prep labs before class, or his own space for grading papers and planning lessons. He worries he’ll have to change his approach to teaching. Hillside School, which has a small jungle gym near the parking lot, will now house nearly 500 elementary school students. Welch says the school just told him he can’t buy any more school supplies - including for his lab. “There’s 3 months left - the money’s gone - if you want to do something it comes out of our own pockets now. Because we’re trying to just survive for next year,” he says. “We still do not have it figured out,” says School Board Chairwoman Nicole Plourde. After all these difficult decisions the board has made, they’re still over budget. 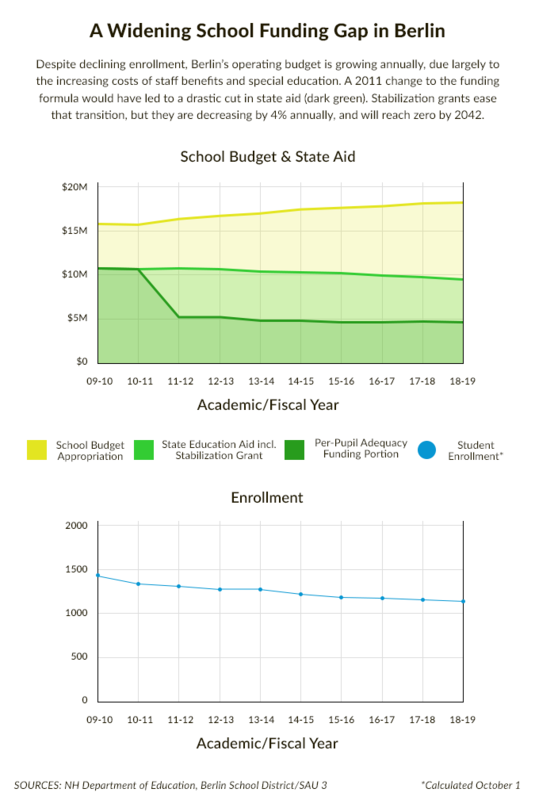 So, the school board needs to make more cuts. 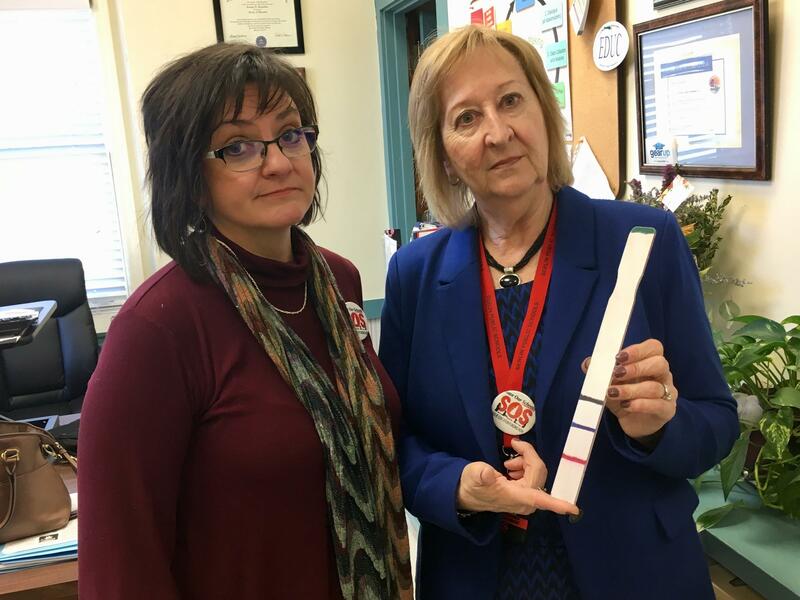 School Board Chairwoman Nicole Plourde (left) and Superintendent Corinne Cascadden (right), holding a ruler showing the difference between property values in towns across N.H. In the last few years, as the state has cut annual aid, over 20 staff members have left or retired from Berlin. Plourde says this loss far outpaces declining student enrollment, but the school board hasn’t filled any of these positions. Instead, it’s used that money to cover rising special education costs and other items like teacher retirement and health insurance. The board has avoided laying off staff, but they might have to do that in the next few years. 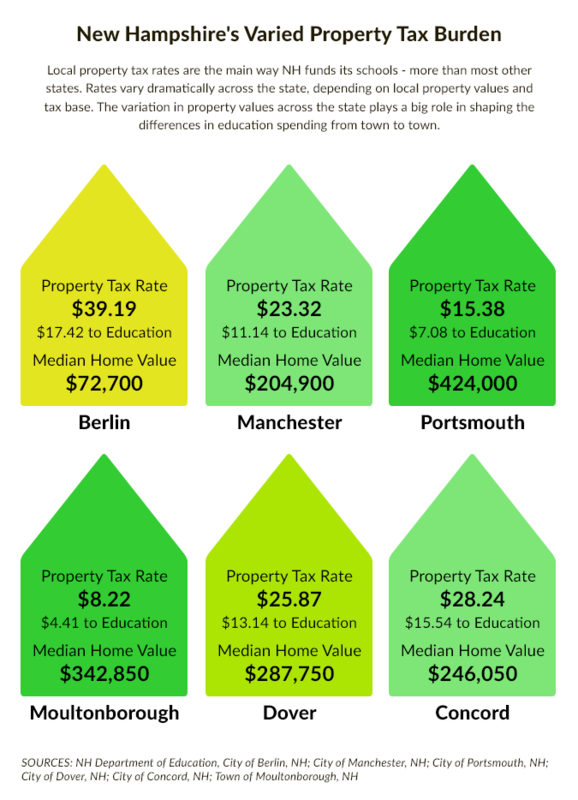 Plourde says, when she looks at how much wealthy towns a couple hours drive south can raise through property taxes, with far lower tax rates than Berlin, it feels like two worlds in one state. Plourde and the rest of her board are watching the statehouse closely these days. A few bills would stop the cuts to stabilization aid. But she worries even that would just buy Berlin a few more years. She’s hopeful lawmakers will go back to the basic funding formula and increase per-student aid. But, she says, "We can't build a budget on hope."